Is your medium to large business located in another state but you want to give your clients the comfort level that you are also a local Portland, Maine company? With Executive Office Centers, your staff can work in your shared, furnished office rentals when needed, focusing on your Maine and New England customers, and leave business support services and office space management to us. Join Fortune 500 companies and other local and national tenants at Executive Office Centers. Our high-speed Internet connectivity and high-spec telephone infrastructure is ready for your business. You can be a Maine company and still be connected to the Home Office anywhere in the world. Regular upgrades ensure a state-of-the-art voice and data communications system. Configure your office to your needs, complete with furniture, telephone equipment and Internet connectivity, and a highly professional business support team. Plus, you have the best business address in Maine, The Time and Temperature Building in the heart of Portland’s Business District. Create the right impression with a professional meeting environment, delivered cost-effectively with complete business support. 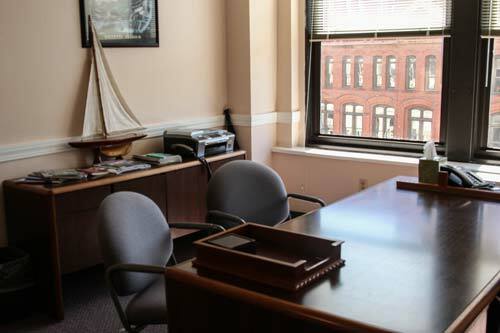 Contact us to see how Executive Office Centers shared office rentals in Portland, Maine can help your medium to large business with office space and facilities. Your staff will be happy and your shareholders will thank you.